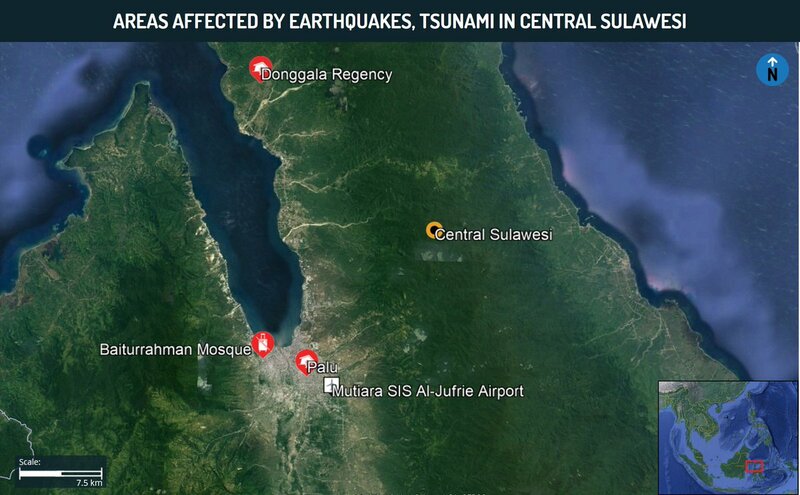 See images of the tsunami that hit Sulawesi. Dozens of earthquakes rocked the region, but a tsunami didn't seem imminent. Then the massive waves began crashing in. On Friday, a powerful 7.5-magnitude earthquake shook the Indonesian island of Sulawesi, just after 5:02 PM Western Indonesian Time. Dramatic videos revealed the eerie growth of a mounting wave in a bay near Palu eventually crashing into the coast, sweeping away beach structures as onlookers scatter. Scientists were surprised by the ensuing tsunami, which resulted in conflicting warning messages. But experts suggest that the area's unique geology could be to blame for the unusual progression of the disaster. 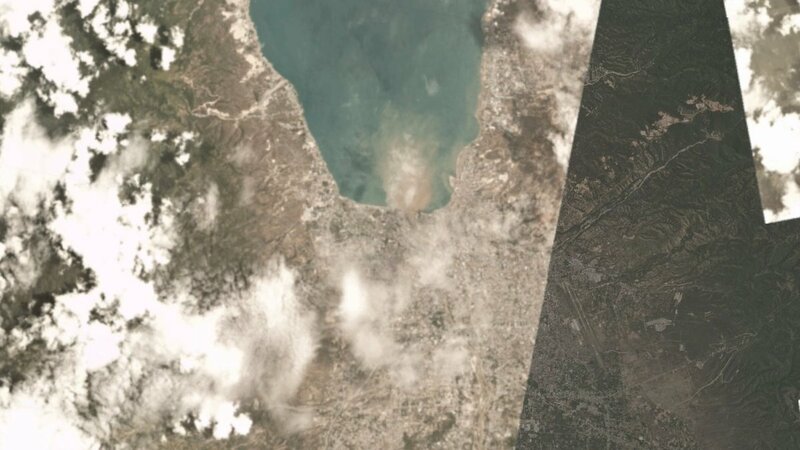 Satellite imagery of Palu taken today (Sept 29th), the morning after. You can see that debris from the tsunami is flowing back out into the sea via the river. 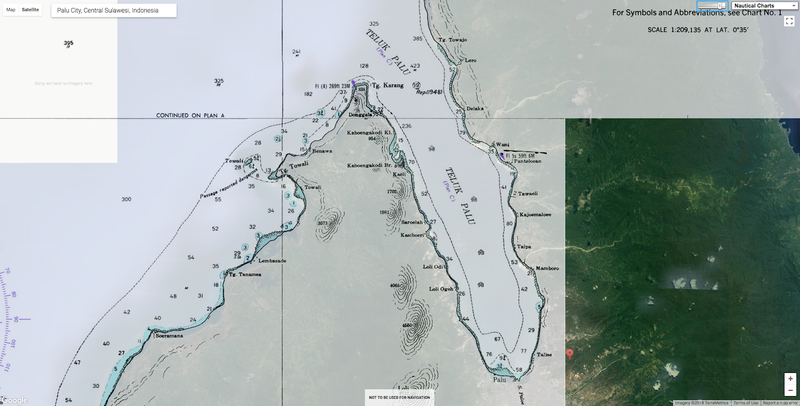 Tsunami entered Palu Bay, which could theoretically amplify the wave's effects. Hundreds were killed in Palu, where buildings collapsed and waves reached as high as 18 feet. The earthquake followed a series of temblors that began around 2:00 PM WIB with a 6.1-magnitude quake. That event not only destroyed dozens of houses but resulted in one death and at least 10 injuries, according to Reuters. The ground continued to roil with 27 aftershocks that eventually gave way to the intense, shallow 7.5-magnitude temblor centered about 6 miles deep, according to the U.S. Since then, dozens of aftershocks continue to rock the island. The total damage from the powerful quakes is still unclear—but devastation appears to be widespread. According to a statement from the Badan Nasional Penanggulangan Bencana (BNPB), the Indonesian natural disaster agency, the earthquakes have caused widespread power outages, which have crippled communication, but local agencies are working to resolve the situation. Sutopo Purwo Nugroho, BNPB spokesperson, announced via Twitter that the Indonesian army has been deployed to assist with search and rescue. As of Sunday evening, local time, the death toll had jumped to 832 people—and officials worry that number could still sharply rise since search-and-rescue teams have yet to reach many regions. This includes the regency of Donggala, home to some 300,000, where communication remains limited and landslides have severed rescue workers' access. Indonesian Agency for Meteorology, Climatology and Geophysics (BMKG) initially issued a tsunami warning but soon retracted it based on analyses at the time. Yet monstrous waves began crashing on shore, captured in videos that quickly began circulating on social media. The timing of these events, however, remains unclear. BMKG officials contend the waves arrived before the warning was lifted, reports CNBC. Even so, the towering waves took many by surprise. One particular video seems to be recorded from the upper floors of the circular parking structure at the Palu Grand Mall, showing waves rushing in below. It cuts off as the crowd starts to run, seeking safety from the wall of water. Tsunamis typically are the result of the abrupt motion of large submarine earthquakes at tectonic plate boundaries. And earthquakes are not uncommon in Indonesia; the island chain sits within what's known as the Ring of Fire, a curving horseshoe-shaped chain of tectonic plate boundaries that hugs the Pacific basin. It is home to around 90 percent of the world's earthquakes. 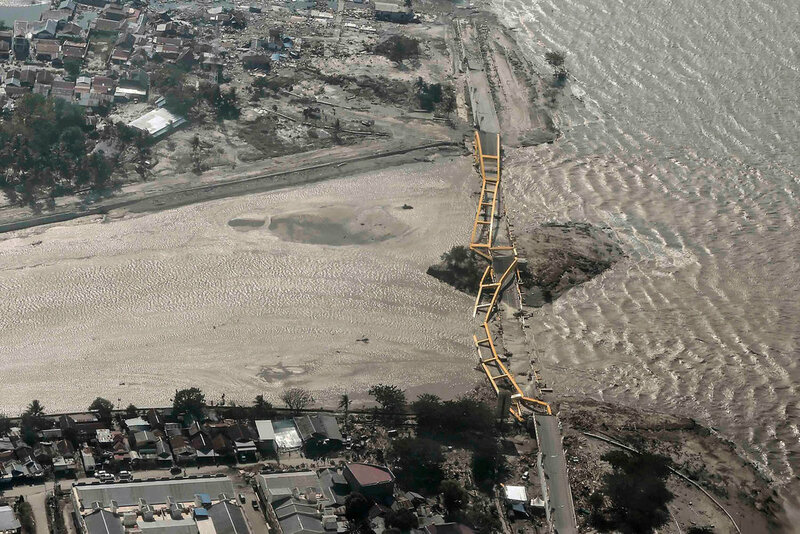 A bridge damaged by an earthquake and tsunami in Palu, Indonesia. The 7.5-magnitude earthquake appears to be the result of what's known as a strike-slip fault, which takes place as two blocks of crust grind against one another, largely in a horizontal direction. Tsunamis more commonly follow vertical movement in the crust, which disrupts the overlying water and can generate massive waves crashing onshore. “It is definitely a surprise,” says Baptiste Gombert, a geophysicist at the University of Oxford. He notes that Indonesia's geology is highly complex. A spidery web of different types of faults cut through the region, so teasing out exactly what happened is a challenge. But preliminary results hint at a few possibilities. The tsunami might be the result of some vertical movement along the fault, Gombert says. But he finds it unlikely this could entirely explain such high waves, which were reported to stand as tall as 18 feet. “Even if there was a little vertical displacement, this is a pretty big tsunami,” he says. It's likely landslides—either submarine or from the shores—also disturbed the bay waters, causing the wave. The bounds of the bay itself may have also been an issue, notes Janine Krippner, a volcanologist at Concord University. “That can amplify wave height as it channels water into a smaller area,” she writes via Twitter message. But she emphasizes that there is still a lot of uncertainty surrounding today's events. Indonesian agencies are directing locals to remain aware of continued dangers. “People are encouraged to remain vigilant,” said disaster agency spokesman Sutopo Purwo Nugroho, the AP reports. “It is better not to be in a house or building because the potential for aftershocks can be dangerous. People are encouraged to gather in safe areas. BNPB put out a call on their official Facebook account for anyone with internet access to help catalog the damage in Palu city and Donggala districtusing the collaborative online project OpenStreetMap. 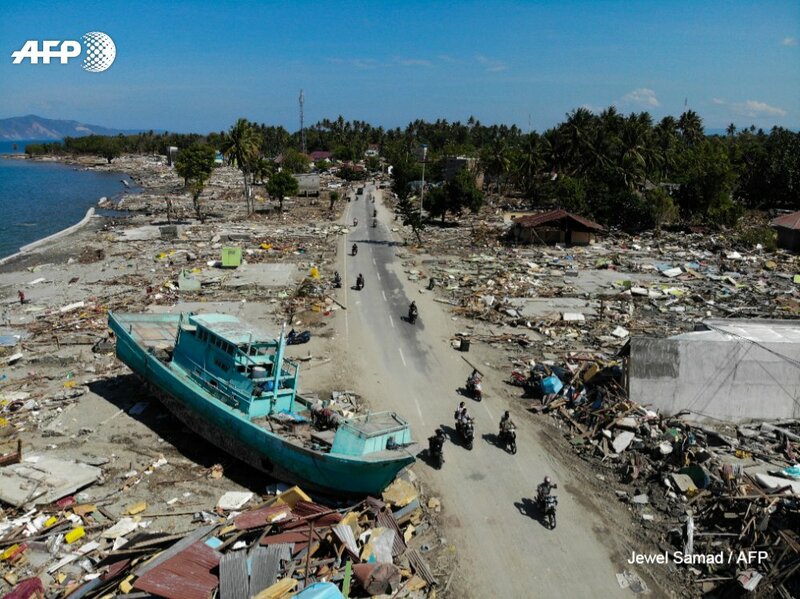 National Geographic : Will Indonesia be ready for the next Tsunami ?